Indulge yourself with a piece of jewelry made just for you! 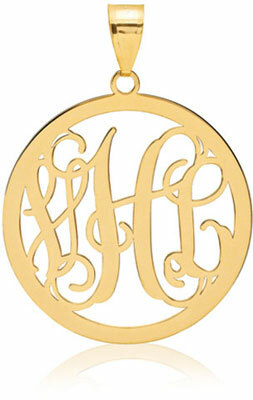 This Monogram Medallion Pendant in 14K Gold can be personalized with up to three letters of your choice, and arranged in a truly unique design that will impress those who see it. If you are looking for something original, this medallion pendant carries a statement that is all about you. The pendant features a solid, 14k yellow gold border measuring 32mm by 32mm, not including the bale. At the center of the piece is a beautiful design made from three initials, carefully cut into the gold in a dazzling display of artistry. The curves of the letters work around the gold border into one seamless work of art. The gold is polished to a perfect shine and a simple bale is set at the top of the piece to hold a chain in place.